How to add a steeked zippered compartment and Kaled mutant to the EXTERMIKNIT! 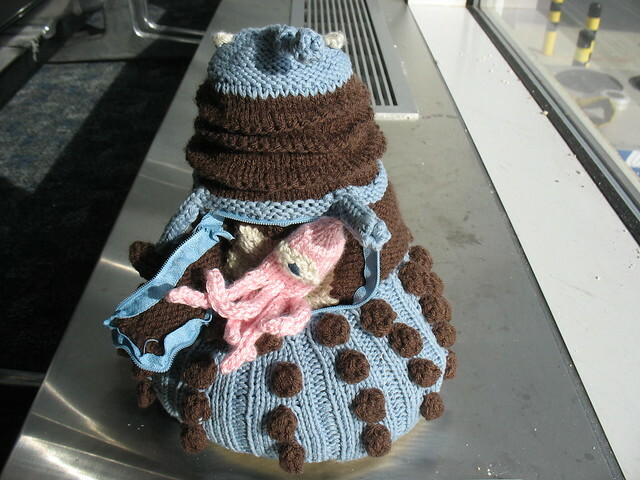 knitted Dalek toy pattern. 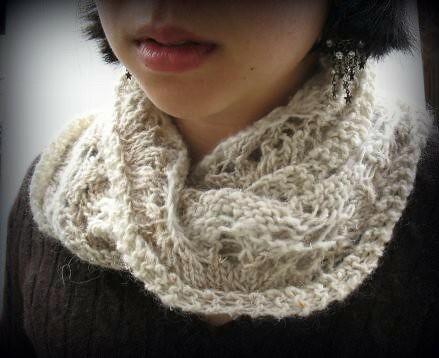 Bel Canto (rav link), a shaped cowl with a simple but dramatic lace-framed braided cable swooping diagonally across a stockinette background. 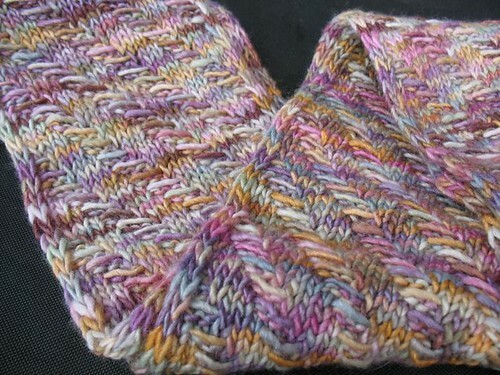 Uses just one skein of Malabrigo Rios Superwash. 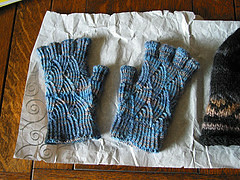 Published in the Winter 2010-2011 issue of Knitcircus Magazine. Now self-published, reknit in Malabrigo Merino Worsted, and available to buy now on Ravelry. Here Comes the Sun, an accessory set including instructions for a ribbed slouchy beret topped with a star motif and a matching reversible scarf with a wavy rib pattern (made with just increases and decreases–no entrelac required!). Both charted and written instructions are provided. 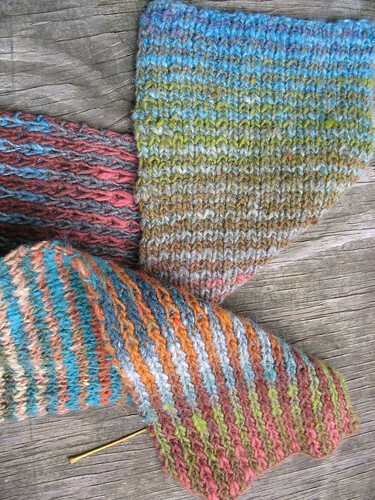 Latitude and Longitude, an accessory set including instructions for a two-color hat, cowl, and scarf, all fully reversible, with vertical stripes on one side and horizontal stripes on the other. 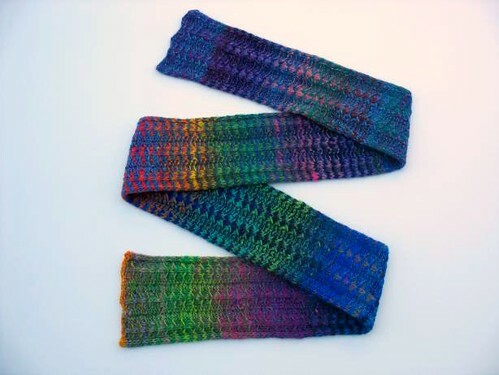 The pattern uses only knits, purls, and slipped stitches, with only one color of self-striping yarn (such as Noro Kureyon) used per row. Both charted and written instructions are provided. 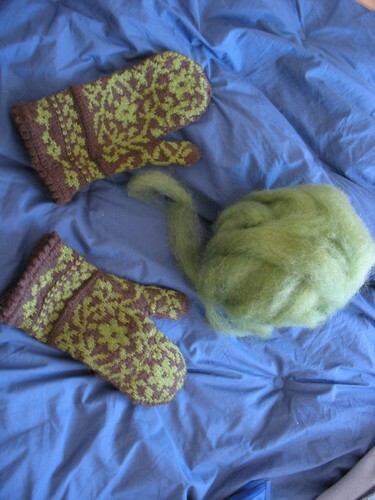 A tutorial for adding afterthought thrums to stranded colorwork mittens (or any other stranded colorwork item that could use some extra warmth). The Tyro Socks, toe-up lace socks for beginners featuring a short-row toe and heel and an easy wave lace pattern, mirrored on the left and right feet, provided both as a chart and written out. 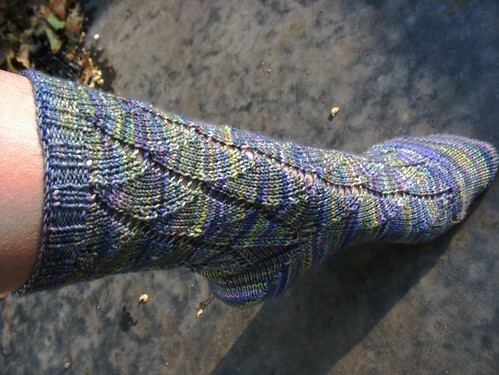 The pattern also includes a photo tutorial on working the short-row toe and heel. 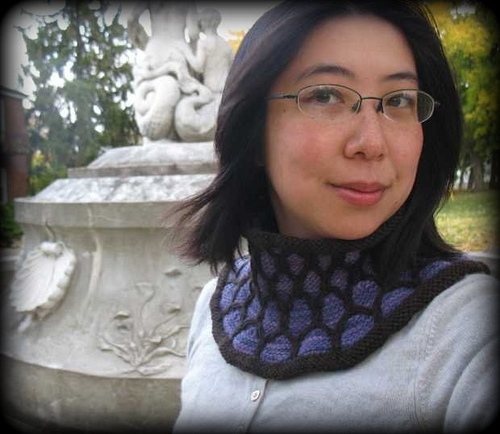 Metheglin, a lovely and unusual cowl featuring a combination of stranded colorwork and interesting texture: slipped stitches form a honeycomb pattern over a garter stitch base of a contrasting color. It uses less than 100 m/110 yards/50 grams of each of two colors of worsted weight yarn, making it a great showcase for a small amount of something precious, luxurious, and soft. 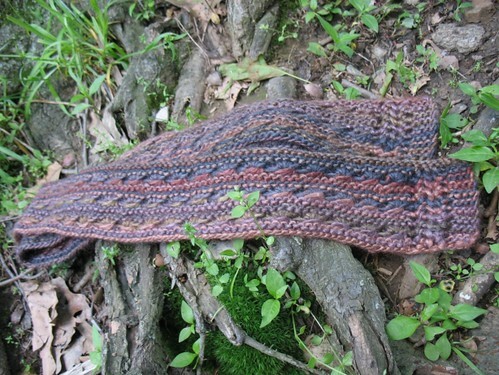 The Windflower Scarf, a simple but elegant reversible scarf for lovers of garter stitch. 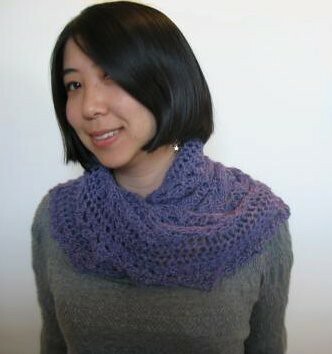 The anemone stitch pattern looks complicated, but this scarf is actually very easy to work, and completely suitable for beginning knitters. 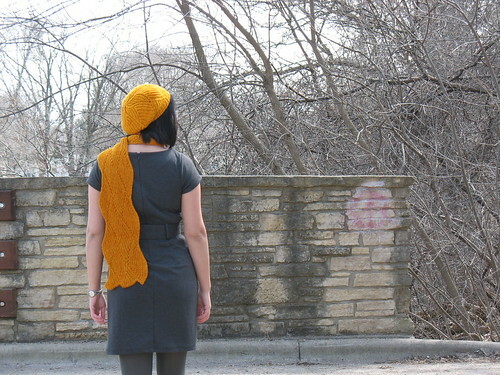 The pattern is written for DK and worsted weight, and includes a worksheet for customizing the scarf to other gauges. 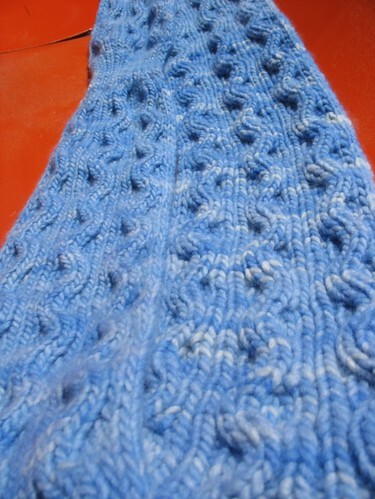 1) Cabled waves on one side, quilted gull stitch rib on the other. Shown in lavender-ish Malabrigo Silky Merino. 2) “Wings to Fly”: Quilted gull stitch rib on both sides. 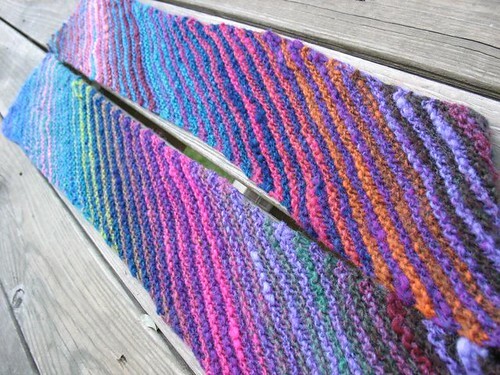 Shown in rainbow striped colors of Noro Kureyon and Plymouth Boku. 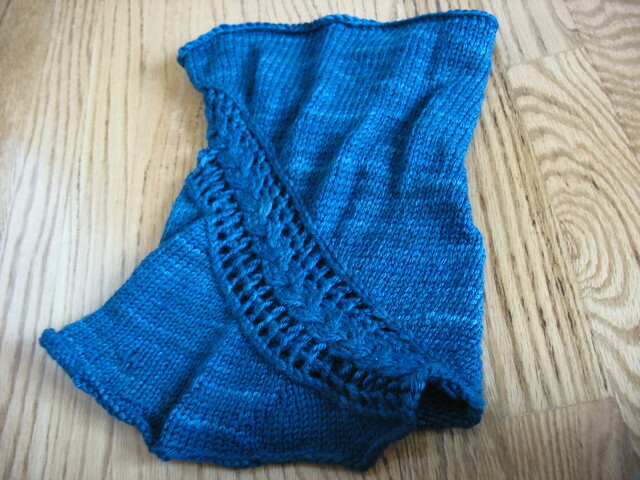 3) “Sailing the Sea”: Wave cables on both sides.And 3a), shown in the photos in blue Malabrigo Merino Worsted, is the Sailing the Sea variation, but worked with a keyhole fastening instead of as a plain flat scarf–this uses less yardage than a full scarf would, and holds the scarf securely in place around your neck. 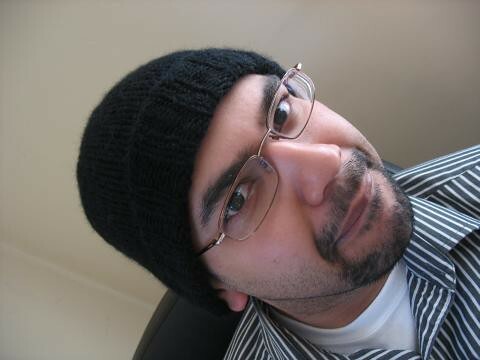 A Very Plain Hat, a double-stranded stockinette watchcap with 2×2 ribbed brim. Designed for my boyfriend, who will not wear any hat with too much fancy business going on. I love the blue cable knit purse with the silk bow. Do you have a pattern for it that I may purchase? Please advise. Love your blog- I go to a woolly thoughts knitting group in our village boookshop-coffe, homemade cake and chat as well as knitting of course. I write a free monthly email newsletter inspiring people to be more creative- would it be possible to send it to you? you could of course unsubscribe if you don’t like it. If you do could you let your readers know about it and I could recommend your blog on it? Hi, I love your botany baby sweater. Is there a way for me to purchase the pattern? I really congratulate your blog – would like to spend more time looking at all the patterns posted, it is 11:49 and I don’t fell tired, really awesome! I recognize another Cowboy Junkies fan! 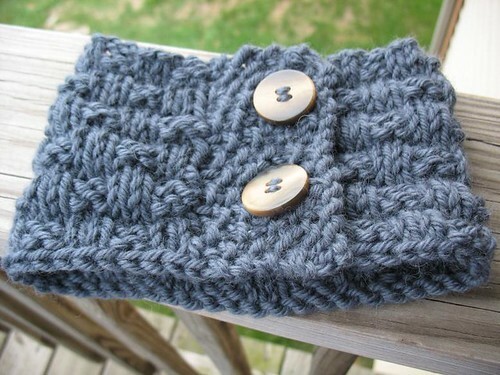 I love your cowls, especially the newest one!